RCV Performance Products specializes in industry leading quality parts for countless motorsports applications from Ultra4 race cars, desert cars, Pro4 trucks, to Jeeps, Toyotas, UTVs, and Rock Bouncers. All products from RCV are designed, manufactured, assembled, and tested with pride in the USA. RCV Performance has been proud to be involved in King of the Hammers since the beginning. Over the years the progression of the industry has demanded more and more product that can handle the abuse of the “toughest 1-day race in the world”, and we have been there every step of the way providing the best solutions possible. When the UTV race was introduced, we saw another need and began to develop what we feel is the Strongest Axle on the Planet. RCV Performance Products is introducing the all-new CARBON FIBER prop shaft to our UTV line featuring specially designed CVs. The carbon fiber design with hard-coated 7075 aluminum end yokes is HALF the weight of OEM, reducing rotational mass, increases acceleration, and reduces any possibility of vibration. Additionally, the dampening effect of carbon fiber will reduce shock load and stress on other components such as transmission and front differential. The heavier steel tube will see deflection at high-RPM critical speed, the low mass and high rigidity of carbon fiber reaches a critical speed much higher than any UTV is capable of. The RCV CV design is unmatched in smoothness and strength over any u-joint prop shaft. The new RCV prop shaft features 300M CV components that ensure maximum strength. Prop shaft and components are completely sealed and rebuildable. RCV Performance Products introducing the new “Pro Series II” axle for the Can-Am X3 X DS and X RS. The axles feature a plunging inboard and outboard CV much like the factory design, however every opportunity to improve was taken to maximize strength and longevity. The front inboard CVs are an all 300M construction in addition to all the CV internals featuring 300M components. The front axle is our 300M Pro Series 33 spline shaft, which is second only to our rear 40 spline 300M shaft – by far the largest axle diameter in the industry. The rear outboard CV has been increased in size comparable to a full size truck CV to take advantage of additional room at the hub. 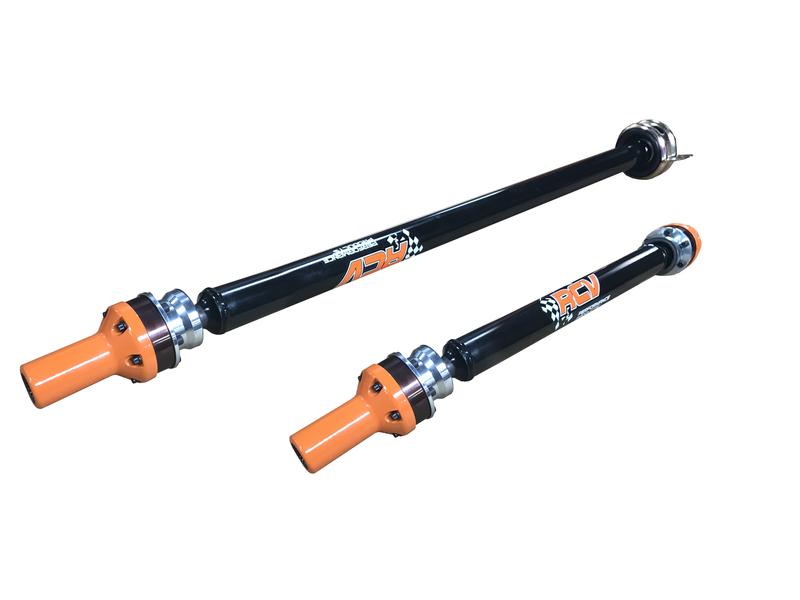 These axles are designed for harsh racing conditions where heat build-up is a concern. The specially engineered RCV Spec Grease is featured in both the inboard and outboard CVs to battle these extreme conditions. RCV is introducing the ultimate solution for strength – our Super 60 CV axle set. Designed to work with the big Ford Superduty applications, but also available in several different configurations available for custom applications. The CV is our “big bell” housing with 35, 40, and 47 spline options available. The outboard stub is designed to replace the lock-out and engage directly into the 1.75” 32 spline unit bearing hub providing maximum strength. The new Super 60 is a great option for custom axle builders looking for options up to 47 spline axles. RCV CV Axles are low maintenance and operate with a smoothness you can feel – whether off road or on the street. As always, our Super 60 axles are backed with a “No Questions Asked” limited lifetime warranty. RCV has expanded into the side-by-side industry with 300M axle shafts many popular UTVs. The latest product for the Polaris RZR and Can-Am X3 is the updated 300M ball joint. Rated at 275% stronger than stock, it is the toughest ball joint on the market. The new design offers adjustability for wear compensation to and maintain a tight fit. It also features a grease fitting to prolong the life of the ball joint. RCV Performance Products specializes in industry leading quality parts for countless motorsports applications from Ultra4 race cars, Pro4 trucks, to trail Jeeps and Toyotas, and now UTVs. All products from RCV are 100% Made in the USA, and are strength tested in-house.